Posted October 11th, 2016 by Marcia & filed under Active Listening, Corporate Culture, Personal Effectiveness, Work Life Balance. Mindfulness has become a buzzword in corporate vocabulary over the past few years, and for good reason. From parents to entrepreneurs to high-powered executives, many people have recognized the benefits of paying attention to their emotions, intentions, and strengths and limitations. More and more research indicates that mindfulness is a practice just as helpful in the workplace as it is in the yoga studio. Looking to incorporate some mindfulness practices into your company culture? Here are some good places to start. One of the primary principles of mindfulness is that we recognize what needs to change within ourselves. Only then can we make changes in our environment. EDS’s Increasing Personal Effectiveness encourages this type of awareness. Only by recognizing important internal factors (how we see ourselves, how we manage conflict, how we own our choices) can we develop more effective practices. Adopting new productivity habits without understanding why we need them is a bit like treating the symptoms of an illness rather than the illness itself. It just won’t work in the long run. The more demanding our workdays become, the more focus and productivity suffer at all levels. Leaders and executives have the ability to invest in a culture of mindfulness, often with a big payoff in terms of overall performance. Offer yoga or guided meditation classes over lunch or before/after work hours, encourage a mid-morning group walk around the block, provide training in active listening, or hold brief “mission” meetings regularly to discuss strategy (not what needs to be done, but why). An important part of mindfulness is accepting what you can change and what you can’t. Sometimes all that’s in your power to change is your own response. Minimizing distractions and increasing focus allows us the ability to truly listen and respond to questions, concerns, and problems that come our way. Seek to understand and listen first before firing off a hastily written e-mail. Take time to think and weigh important factors before you make a decision. Leaders with the most impact are those who can build and successfully manage great teams. Every day, we help our clients and colleagues achieve their highest levels of professional presence and personal effectiveness. That includes everyone on the ladder, from company presidents to project managers to staff members. Contact us at 800-282-3374 to find out how we can help you impact your own productivity and the productivity of your entire organization. Posted October 6th, 2016 by Marcia & filed under Corporate Culture, Employee Development, increasing personal effectiveness, Leadership, Personal Effectiveness. It takes an extremely “talented” leader to drive an already successful business into the ground. Think of all the times a Fortune 500 business names a new CEO; it happens more often than you’d think. Just in the past week or two, Time Inc., Weight Watchers, Etrade, and several other large corporations announced either the hire or the search for new leadership. Research has shown that successful companies invest in leadership development at all levels. Managers and mid-level leaders are the “boots on the ground” for the company; they are in a key position to critically evaluate which policies are working and which are stagnating, to communicate leadership policy to their teams, and to foster a positive or negative work environment. And when these skills are developed and practiced regularly, they can continue to sustain a business even if the CEO changes. Investment in leadership culture and employee development pays off tremendously in periods of transition. Being well adjusted to changes in leadership is a sign of a company that can roll with the punches. Flexibility is an important characteristic at all levels: managers and leaders need to make adjustments to policy and listen to employee feedback. Encouraging (and modeling) forward-thinking and responsive behaviors creates a culture of trust and respect. Combine these practices with strong leadership development, and this culture will permeate through the entire company. Culture expert Edgar Schein advocates the leadership practice of what he calls “humble inquiry”: asking questions not to interrogate or judge, but simply to better understand. “I think the major pathology in all organizations that I’ve seen is that upward communication is very faulty….If the boss doesn’t [engage in humble inquiry,] we are going to continue to have accidents and low quality products because the information isn’t surfacing.” A culture of openness, where communication both upward and downward is freely encouraged, will promote leadership culture at all levels and encourage a team-based approach. Posted October 4th, 2016 by Marcia & filed under Uncategorized. Often, workplace “fit” is cited as a reason for termination of employment, either from an employee herself or from a manager. “It just wasn’t a good fit.” Just as often, this explanation doesn’t really get at the heart of why the business relationship ends. It’s more than fit, usually; the employee wasn’t a good “fit” because she consistently missed deadlines or wasn’t professional; the leadership of the company wasn’t a good “fit” for the employee because it was dysfunctional or uncommunicative. Mentioning “fit” becomes the kind way to extricate oneself from a bad situation without burning bridges. But in reality, how important is workplace fit to the overall success of a team or a company? The first step in determining fit is having a strong sense of identity and personal effectiveness (both for employee and for the company leadership). Do you have a clear vision for your work? Do you understand your personal and/or company mission? Are you able to honestly assess strengths and weaknesses? Understanding these attributes is key because they require some self-reflection and critical awareness. Only by understanding your own function in the company can you determine whether you are a good “fit” for your position. It’s possible that too much emphasis might be put on finding the right “fit” between a manager and a team. Embracing diversity of approach to problem solving and being able to recognize the strengths of a different opinion or behavioral style are benefits that come along with unlikely pairings. Think of Abraham Lincoln as the subject of Doris Kearns Goodwin’s Team of Rivals; it was by surrounding himself with people who would challenge him that Lincoln became a stronger leader. Posted September 1st, 2016 by Marcia & filed under Communicating To Manage Performance, Leadership. Transactional leaders are those who are more focused on the immediate, day-to-day goals of a group and its members. Rather than focusing too far in the future or inspiring team members to “think outside the box,” these leaders are less concerned with strategy or innovation than meeting benchmarks and maintaining the status quo. Transactional leaders often thrive in management roles. Traditionally, a manager plans, budgets, organizes, oversees staff, controls procedures, and solves problems, whereas an executive (as a transformational leader) establishes direction, aligns people, or engage stakeholders with motivation and inspiration. Managers are not expected to take on the challenges of producing change and moving forward. As long as they maintain order and attain results on a daily basis, they are effectively managing their group. But even though a manager is effective within this narrow definition, a manager can elicit a more positive reaction from his/her team if he/she is a leader as well. 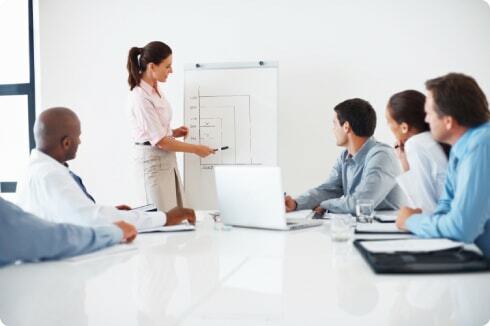 Managers would do well to educate themselves in leadership skills for the better of the group and the organization. In this way, managers can motivate followers to accomplish the tasks at hand in the short term, but also be able to understand why those tasks are essential for long-term success. This series also shows why it’s important for management and leadership to be in sync: any group or organization will need both inspiration and logistics (a heart and a head, or a vision and clear objectives to reach that vision) in order to succeed. If you find yourself in a job description that requires both short-term results and long-term vision, be aware that you’ll need to incorporate both leadership styles into your everyday practice. Posted August 30th, 2016 by Marcia & filed under Uncategorized. Transformational leadership is the heart and soul of any successful business. By being prospective and taking an inspirational and positive approach, these leaders are often considered role models for attitudes and ethical behavior for the group. The four elements of transformational leadership, according to Dr. Ronald Riggio, can have a huge impact on the success and productivity of your team. Does your corporation’s transformational leadership adopt all of these principles? Individualized Consideration: the degree to which the leader attends to each follower’s needs, acts as a mentor or coach to the follower, and listens to the follower’s concerns and needs. The leader gives empathy and support, keeps communication open and places challenges before the followers. This also encompasses the need for respect and celebrates the individual contribution that each follower can make to the team. The followers have a will and aspirations for self- development and have intrinsic motivation for their tasks. Intellectual Stimulation: the degree to which the leader challenges assumptions, takes risks, and solicits followers’ ideas. Leaders with this style stimulate and encourage creativity in their followers. They nurture and develop people who think independently. For such a leader, learning is a value and unexpected situations are seen as opportunities to learn. The followers ask questions, think deeply about things, and figure out better ways to execute their tasks. Inspirational Motivation: the ways in which the leader articulates a vision that is appealing and inspiring to followers. Leaders with inspirational motivation challenge followers with high standards, communicate optimism about future goals, and provide meaning for the task at hand. Followers need to have a strong sense of purpose if they are to be motivated to act. Purpose and meaning provide the energy that drives a group forward. The visionary aspects of leadership are supported by communication skills that make the vision understandable, precise, powerful, and engaging. The followers are willing to invest more effort in their tasks; they are encouraged and optimistic about the future and believe in their abilities. Idealized Influence: the way in which the leader acts as role model for high ethical behavior, instills pride, and gains respect and trust. Posted August 25th, 2016 by Marcia & filed under Leadership. In this three-part blog series on leadership style, we investigate the differences between transformational and transactional leadership: two styles that are both integral to the success of any functional business. A transformational leader is someone who moves a group forward, bringing change and evolving the group to a mutual goal. In comparison, the transactional leader motivates and influences the group to elicit results for the more immediate task at hand, as opposed to a vision prospectively. This leader needs to maintain the current status quo and is a bit less strategically focused. Often, transactional leaders take on more managerial roles while transformational leaders take on a corporation’s executive functions. It seems that transformational leaders are more focused on the “big picture” and long-term goals, while transactional leaders are essential to keeping operations running smoothly on a daily basis. Which leadership style is responsible for setting the moral or ethical principles of the group? Which one most mirrors your leadership style, or which one would you most like to aspire toward? Posted August 23rd, 2016 by Marcia & filed under Accountability, Leadership. What we do, what we say, and what we say we do all add up to integrity. You have integrity in leadership if your word is your bond: your yes is a yes and your no a no. You say what you mean and you mean what you say, and you pay the high cost of fulfilling those words. There are two critical components of integrity in leadership, by which we mean a deep commitment to do the right thing for the right reason, regardless of the circumstances. The first is the adherence to a moral or ethical principle. This isn’t simple compliance to a rule; it implies a philosophical understanding of the reason it exists. The second is the continual pursuit of a better state or condition. Everyone makes mistakes, so being a person of integrity does not mean you haven’t ever committed a moral or ethical violation. It means having the strength of character to learn from those ‘misbehaviors’ and seek continual self-improvement. People judge integrity by the consistency, credibility and reliability of a leader’s behavior, but how do we know it when we see it? The following key points will help you to confirm your perceptions of integrity. Continuous personal growth. Leaders with high levels of integrity are in constant learning mode. They are exceedingly honest with themselves, and are always seeking guidance to discover and work around their blind spots. Keeping promises. Leaders keep their promises, and if they can’t meet the agreed-upon timeline, they will stay in communication until the promise has been kept. Reliability. Reliable leaders stick with problems and issues until they are resolved with a strong consideration for all stakeholders involved. Responsiveness. There is nothing more frustrating than waiting for a leader to respond to your query. Leaders of integrity are good time managers and will either respond immediately and/or will inform team members when they can get back to the issue. If the situation is a crisis, they will be there. Doing the right thing. Good leaders have strong moral principles. Team members can count on them do the right thing at the right time and for the right reasons. They have high personal standards and hold their team members and their corporation to the same high standards. They assess each decision and action against their organizational standards. Respectfulness. Respect is earned by showing respect and acceptance toward others. Respecting others means understanding different values and beliefs; recognizing, accepting and developing the skills of others; and including all employees as part of the team. It also means communicating and interacting with individuals by putting them on the same playing field. Accessibility. Good leaders are physically present and make themselves available and accessible to their staff. They interact with and invite employees to share their issues; they are always available to stop and listen. Transparency. Transparent leaders exhibit openness with respect to information, finances, and operational transactions and business dealings. They create a sense of certainty rather than uncertainty. Lead with integrity, and you can never go wrong. Posted August 16th, 2016 by Marcia & filed under Accountability, Employee Development, increasing personal effectiveness, Personal Effectiveness. It’s remarkably easy to fall back into bad habits once you’ve made a change. Whether you’re consistently late making deadlines or constantly feeling overwhelmed by the demands of your career, the truth is that a lot of your success or failure hinges on your ability to manage stress. Leaders who are able to manage stress effectively are far more likely to have effective teams and better results; those who struggle with managing stress often find that their personal and professional lives suffer, to the point where they’re eating poorly, gaining or losing weight, and not sleeping. This creates a vicious cycle, where the physically exhausted are unable to focus on work that needs to be done, perpetuating feelings of inadequacy. If you’re able to rise above the stress and begin to establish better habits for dealing with it, the easiest way to lose traction is to tell yourself “lies” that make you think you’re more able to handle everything than you actually are. Do you say any of these to yourself? If so, it might be a warning sign that you’re about to get a lot busier. “I have plenty of time for that complicated task. I’ll do it later.” The most challenging part of time management is figuring out and acknowledging how much time something actually takes. On a good day, it might take only 10 minutes to get to the workplace — but invariably, if you allow only 10 minutes you’ll be riddled with stoplights, extra traffic, construction, and a looming sense of dread. Be honest with yourself about the time you’ll likely spend on each project, and be sure to schedule that time appropriately. “Later” isn’t a day on a calendar. “I wonder how that project is going?” Great leaders are those who utilize the strengths of their teams. Spending your time on tasks or projects that others have been hired to handle only creates more stress; you’re taking on multiple jobs and likely not doing any of them particularly well. Learn whom you can trust and to whom you can delegate, and then let those people do their jobs. You’ll enjoy doing yours much more. “What’s taking so long to meet those goals?” In a results-based culture, it’s easy to lose track of progress in the race for achievement. But not acknowledging the steps that you, your employees, or your business are taking to be more productive and create better outcomes can, ironically, hamper your success. Focusing only on long-term targets or the bottom line disregards the human element of experimentation, failure, and learning that often creates more sustainable results. Instead of “what,” ask “how”: how can I motivate my team to perform more effectively? How can I be a better leader today than I was yesterday? Posted August 16th, 2016 by Marcia & filed under Conflict, DISC Personality Styles, Employee Development. Manage conflict better. Understanding how you’re tempted to react to personal and professional conflict helps you to change those behaviors for the better. Do you immediately become defensive if something isn’t going well? Do you retreat into your office or address problems head-on? Learning the strengths and weaknesses of your conflict management style can help you effect positive change in your work environment. Become a better leader. The result of four years of research and development (not to mention several more in the field), the DiSC assessment brings a wealth of resources to managers. Personality styles directly influence how you lead your team and achieve (or don’t achieve) effectiveness. Understanding your team members’ individual personality styles can also be a useful tool, so that you know how to adapt your approach in a way that will yield better feedback reception and results. Increase sales and productivity. Believe it or not, personality assessments can actually help strengthen your bottom line. In addition to enhancing your leadership skills, the DiSC assessment can offer positive, long-term strategies for understanding your sales style and adapting it to customer buying needs. Make stronger connections with clients and enhance your credibility. Interested in learning more about the DiSC assessment and how it might help your company? We’d love to discuss it with you. Posted August 11th, 2016 by Marcia & filed under Actively Engaged Workers, Employee Development, Performance Management, teamwork. We’ve all worked with people who just weren’t team players. What becomes obvious as the days and weeks pass is that even one person who exhibits toxic behaviors in the workplace can seriously impact the way a team functions. Often the best course of action is to address and treat ineffective behaviors before they seriously damage the culture of your workplace and the morale of your team. And as with all problems, the first step is to recognize and diagnose what has become an issue. Here are some common toxic behaviors. Do you experience any of these when working with your team? Lack of accountability. Often, problematic teams feel that one or more people are not contributing their fair share of the workload. This in turn leads to bitterness and resentment toward the person in question. If these problems aren’t addressed clearly, the employee may, in turn, feel that animosity but not understand why it’s being directed at her. While it’s often bad enough when a team member isn’t contributing fairly, team unity can suffer even more when the person shirking responsibility is in a leadership or management position. Which, of course, brings us to distrust. If a team does not trust its leader to follow through on promises, advocate for them with higher management, or give them credit where it’s due, that team will suffer. Groups can only function effectively if each member considers one another competent and well-intentioned. If there is any doubt about the ability of a team member to perform his or her job (or act without sabotaging the work of another), those toxic aspects can definitely harm the team. Distrust can also lead to a fear of speaking out. Toxic work environments often have dual conversations happening at any given time: the one that the leadership hears (mostly positive and deferential) and the one that happens in whispers or text messages in private. Coworkers may gossip or complain to each other about issues that they don’t feel were adequately addressed by management. This, in turn, creates an “us vs. them” mentality and dissuades team members from being vocal about their problems from the beginning. It also, in the long run, hampers productivity and institutional effectiveness. If you feel that any of these behaviors are present in your work environment, consider our Five Behaviors of a Cohesive Team program. We address common problems that teams experience and work from the inside out to effect positive change at all levels of the workplace.